Rejecting a hard-line view, whether conservative or liberal, the Chief Justice has sometimes authored or joined a separate concurring opinion. In the last post, we looked at a few cases where Roberts was in the majority, endorsing a position more moderate than that taken by other conservative Justices, or by liberals on the Court. Let's take a look now at some cases where he similarly took a more moderate position, but did so by clarifying, emphasizing, or distinguishing his own view in a concurring opinion. That is, where his position--what some might call "split[ting] the baby"--was distinct from that of both the majority and the dissent. As in those cases discussed in the last post, these cases, with the CJ in a separate concurrence, find him rejecting the dissenting opinion. But they also show him expressing a view that is less rigid, less ideological, and more subtle than that taken by the majority. As in the last post, let's look at 5 such cases. Three of the Court's conservative Justices--the 2 most (Scalia and Thomas) and 1 more moderately so (Kennedy)--took the position that someone arrested and taken to jail for processing and awaiting an initial appearance before a judge can be strip searched for jail-security reasons. This is so regardless of the crime. And regardless of the lack of any suspicion that the person might be dangerous or might possess contraband. The Court's 4 liberals argued that the strip search was entirely unreasonable and, hence, unconstitutional. The supposed offense was minor, and the arrestee was not suspected of being dangerous or of possessing anything dangerous or illegal. The Chief Justice (as well as Alito, who wrote his own separate concurrence) voted with the conservatives, thereby giving them the majority. But Roberts wrote a short concurring opinion. He emphasized that the Court's ruling was qualified. It depended on particular facts. As he noted, there was apparently no alternative in this case to placing the arrestee in the general jail population. Moreover, the narrow issue before the Court, as argued by the arrestee's lawyer, was whether suspicionless strip searches were illegal "no matter what the circumstances." A collection of conservative and liberal Justices formed the majority to invalidate a California law banning the sale or rental of violent video games to persons under the age of 17. That majority ruled that video games were protected speech under the 1st Amendment, and that there was no real proof that violent video games harmed children or made them more aggressive. In dissent, a mixed duo (conservative Thomas and liberal Breyer) argued that the law was perfectly permissible. Thomas argued that free speech was not intended to protect the choices of children, but of their parents and other adults. Breyer argued that the violent materials defined by the law are outside 1st Amendment protection--i.e., material "utterly without redeeming social" value--and that studies did show the harm of such games to minors. The Chief Justice joined Justice Alito's concurring opinion. For them, there was merit to both the majority and dissenting views. But also flaws. Ultimately, Roberts joined Alito to say that it is constitutional to restrict some choices by children and to allow their parents to make the choices for them. That there is in fact good reason to be concerned about the effects of violent video games on children. But that California was insufficiently clear about which video games actually fell within the prohibition. If the law were clearer, it would pass constitutional muster. The liberal Justices plus Kennedy formed a majority. They ruled that life imprisonment, without the possibility of parole, is unconstitutional for a non-homicidal crime committed by a juvenile. It is cruel and unusual because it permits no consideration of the immaturity of children or of their potential for growth and rehabilitation. The conservative dissenters (Scalia, Thomas, and Alito) argued that such a sentence is entirely constitutional. According to them, the "cruel and unusual" prohibition is very narrow and, except in capital cases, virtually all discretion about sentencing is left to legislators and sentencing judges. 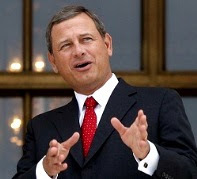 Chief Justice Roberts voted with the majority to invalidate the sentence. But he took a narrower view. He rejected the majority's absolute rule as contrary to the Court's precedents, and because it eliminated the possibility that life without parole might well be appropriate for more serious crimes. He also rejected the dissenter's view that such a sentence was acceptable in this case. For Roberts, the offender's youth and immaturity, the nature of the crime (a non-homicidal, non-domicil, armed burglary), and the "extraordinarily severe punishment imposed"--together rendered the sentence unconstitutionally excessive. In this very divisive case, about a seemingly very minor matter, Justice Kennedy authored the opinion for a very splintered Court. In short, in order to avoid possible church and state problems, Congress enacted a law transferring a parcel of federal property upon which stood a Christian cross--and which was situated within national park land--to private ownership. The Court upheld the law. Kennedy said that the government was not endorsing Christianity. It was merely accommodating the public's acknowledgement of religion's role in society. The Court's most conservative Justices, Scalia and Thomas, voted with Kennedy, but had their own reasons for the outcome. They insisted that the courts should not even be involved, because there was no "actual or imminent injury" suffered in the case. All 4 liberal Justices voted to enforce the order of the federal trial court that had found the government in violation of the Establishment Clause. In the view of that court, adopted by these 4, both the cross on government property and the government's efforts to save the cross by transferring the land “convey a message of endorsement of religion” to “a reasonable observer.” To the liberal dissenters, that is clearly prohibited by the 1st Amendment. The Chief Justice voted for the outcome reached by Kennedy, but he explained his own reason in a separate single paragraph. For him, there was no need for the lengthy and competing expositions of Kennedy, of Scalia and Thomas, or of the dissenters. The case could be decided very simply. The Court's 4 liberals and Justice Kennedy formed a majority to hold that the accused's right to counsel was violated in this case. In their view, the accused's attorney was unconstitutionally ineffective because he failed to advise his client that a guilty plea would risk deportation. Indeed, the government did commence deportation proceedings when the accused plead guilty to a drug offense. To the Court's most conservative Justices, Scalia and Thomas, there was no right to counsel problem at all. Although the lawyer gave misinformation about deportation, the accused was only entitled to an effective attorney on strictly criminal law matters--not immigration. The Chief Justice joined Justice Alito to adopt a middle position. They agreed with the liberals that the accused's right to effective counsel was violated. But they also agreed to some extent with the dissenters. To Roberts and Alito, the critical fact was that the lawyer did give immigration advice, that the advice was wrong, and that there were serious consequences. In their view, a criminal lawyer should not be expected to give immigration advice, but if he does, it should be correct. So there it is. Between the preceding post and this one, 5 majorities and 5 concurrences where the Chief Justice eschewed a hard-line position taken by other conservatives on the Court. Where he either joined the liberal Justices, or he took a position midway between that taken by the opposing ideological wings of his Court. But it does show that Roberts is not nearly as ideologically extreme as other conservatives on the Court. (Nor--need it even be said--as ideologically liberal as some liberals on the Court.) It does show that there is some give in his usual, normally predictable, largely conservative leanings. It does show that in some ideologically-charged cases, Roberts' voting for the most ideologically conservative outcome is hardly preordained. At least not nearly so as it is with other members of his Court. We saw evidence of this in the Obamacare decision. We saw it in the 10 cases reviewed in this series of posts. We will almost certainly see it again. To what extent? We shall see, and we'll discuss it on New York Court Watcher.